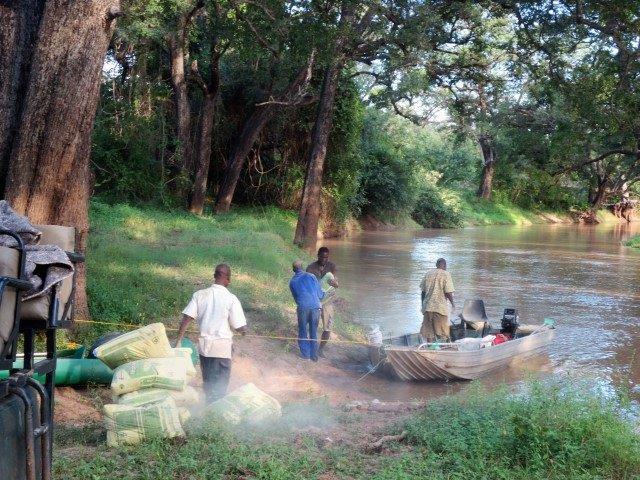 Twenty-five years ago, I began the construction of Kaingo on the banks of the Luangwa River. My father, Barry had spent twenty years in Zambia’s game department, during that time he had sited and built eleven camps in various National Parks around the country. 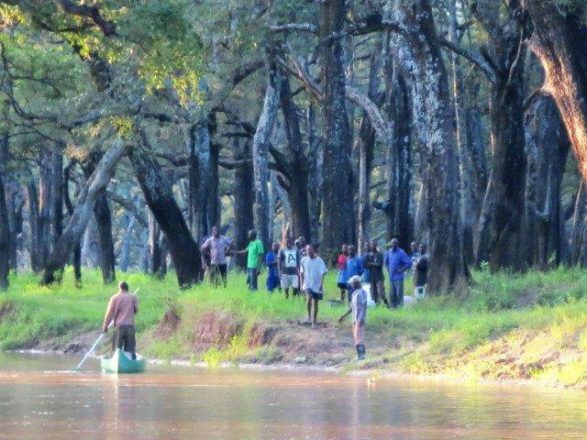 His wisdom, patient counselling, and experience laid the foundation for Shenton Safaris; his choice of site and camp layout was crucial. My mother, Marianne spent many hours working with us on the build; her Swedish flair was put to great use particularly in the setting up of the kitchen and creations of handmade batiks for soft furnishings. I had worked and trained as a safari guide in the Luangwa and having my own camps was a dream for me! I was just a kid, but had committed to building and running the new business and applied myself with vigour to the task. With an Ag Management degree and the experience of growing up on an African farm under my belt, I was eager for the challenge. By the end of 1992 we had 4 chalets and the main dining “chitenge”, staff housing and our kitchen built. 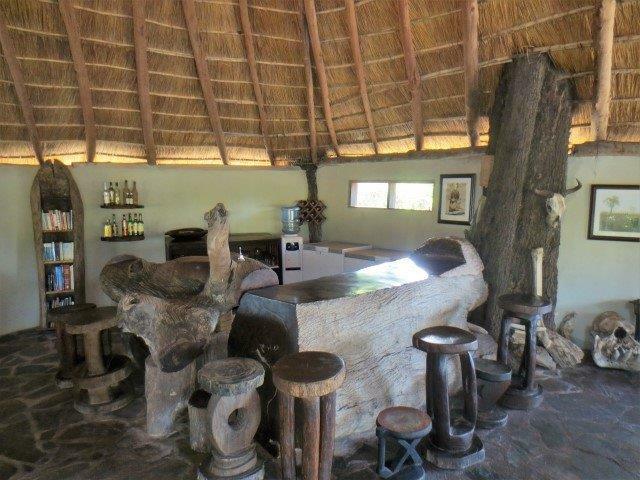 I wanted an organic looking bar and obtained permission to use a massive thousand-year-old leadwood tree that had fallen halfway into the river near our hippo hide site. Using our farm equipment, practical skills and local manpower (several of whom remain part of the family today, including our head guide, Patrick) we managed to set ourselves up with the emphasis on self-sustainability; by midway through 1993 we were ready to open our doors to guests. Shenton Safaris was up and running! Four years later we added two more chalets to Kaingo and built our bush camp, Mwamba along the nearby Mwamba River. Over the years we have matured as a company and developed our unique style of “nature first”, adapting our network of hides and blinds to get closer to the mammals and birds that make up the rich fauna around us. These hides are a wonderful place to sit for photographers and nature lovers alike. 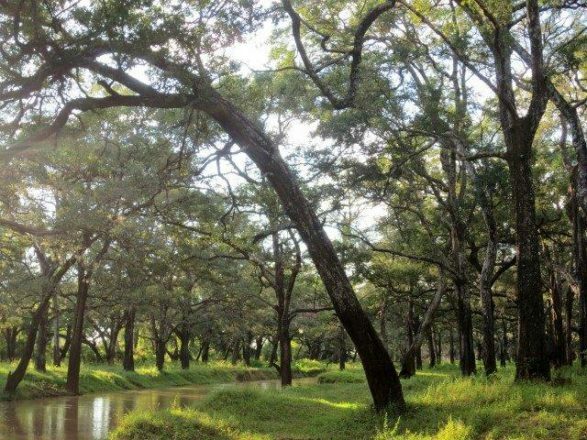 The camps are organically integrated into this most bountiful part of the ancient rift valley and nature is at home here. 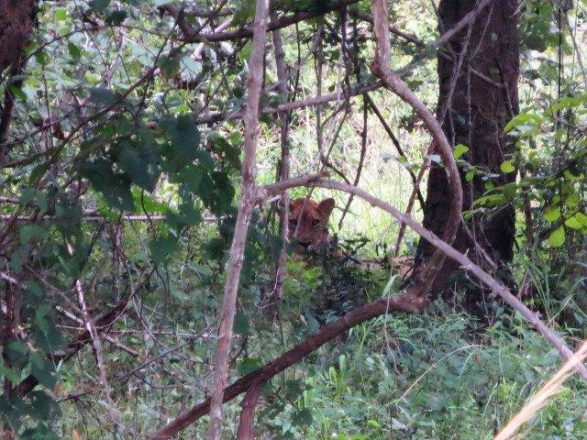 I was reminded again of this during our first week of operation when we had a lioness spend an afternoon under one of the decks in the middle of camp. In addition to the beautiful colours of greens, browns and blues around the lagoons and river system, in the first few days our guests have had two sightings of the Kaingo pack of wild dogs next to the Kaingo signpost (now numbering 9 dogs), good sightings of all 3 local lion prides and multiple sightings of 3 adult leopards including one new female with 2 cubs. Eland, buffalo, elephant, honey badger, civets, genets, vultures, storks, rollers and over 100 crocs on a dead hippo just up from camp all in the first few days of the season! Our guiding team of Pat, Sly, Andrew, Sandy, Yorum, Nicholas and Innocent are all in and raring to go. We are certainly blessed with an amazing area. The wildlife in our area has increased and intensified since we first built Kaingo. There is no doubt that photographic tourism has a positive impact on wildlife populations. 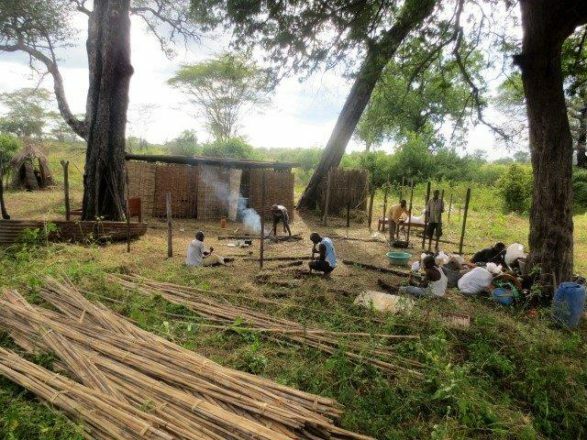 Camp building takes place just after the rainy season ends, normally in mid-April. 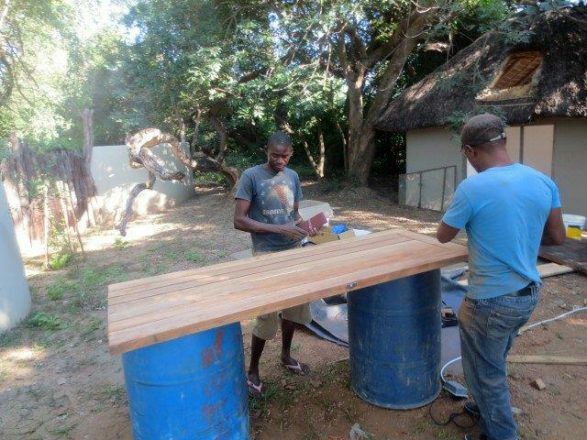 It is a busy time, as both camps need enormous amounts of work to get them ready for guests. 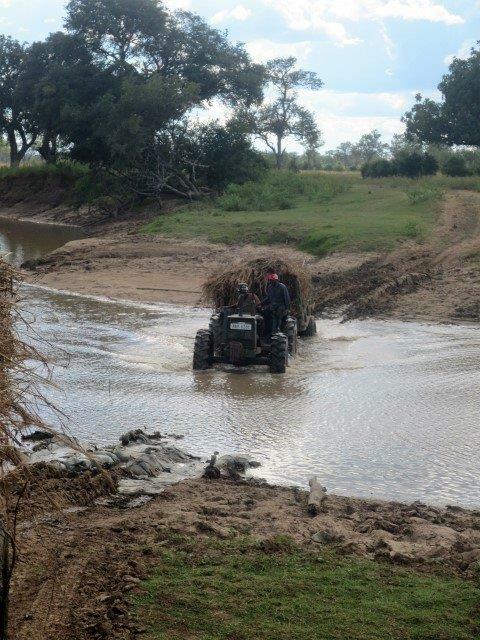 The logistical supplies need to come in from town and in some cases South Africa, Mwamba and the hides all need to be rebuilt from scratch, the veggie garden planted and all 150km of access roads and game viewing loops need to be opened up again using our John Deere tractor and harrow. It takes all of our 50 local Zambian staff a good six weeks to get things in shape in a normal year. This was not a normal year! 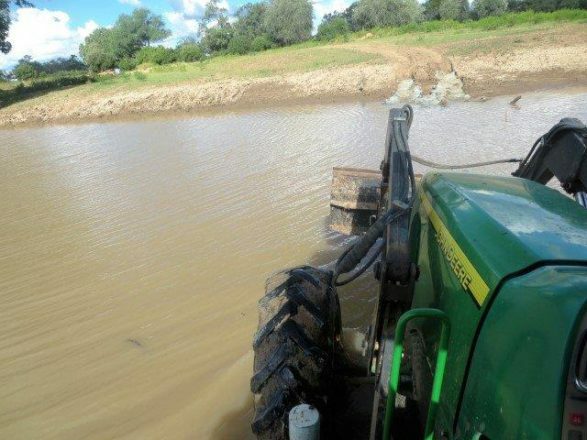 We had very late but good rains , which is good for game, but can be quite challenging when trying to get ready for opening. This year our arrival to camp involved a journey utilising a boat, a tractor and at times our feet as we waded waist deep through small rivers, holding katundu above our heads. Any renovations that need to be carried out in the camps have a very short window of possibility before the site is too wet to access. It is usually dry for a few weeks in November at the end of our season and about 6 weeks pre-season. Midway through 2016, my good and beautiful wife, Jules finally convinced me that we should undertake a major renovation on Kaingo. This is something I’d been avoiding for some years owing to the seeming impossibility of the task. Now that it is done I am very happy Jules twisted my arm on this, although I might not always have shown it during the process, as the task has been herculean! 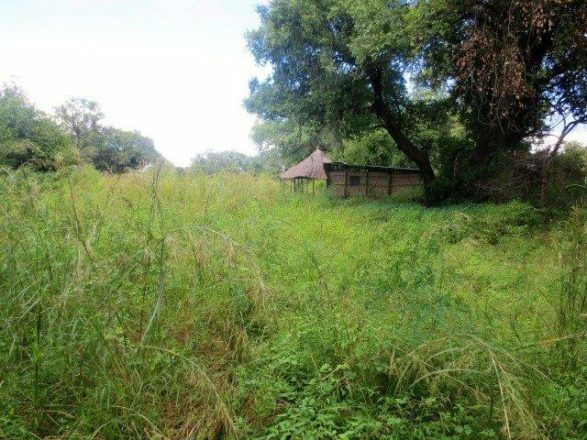 We have opened each of the rooms up to the Luangwa River, replacing the front walls with large sliding doors and adding an outdoor living space. The outdoor baths have been built up into beautiful open-air bathrooms, which are accessed through the main en-suite bathroom. The individual viewing platforms remain on the banks of the river. Our 6th chalet has been expanded into a Deluxe Safari Suite to accommodate a private safari for couples or a private family safari. We’re really happy with the results, the new rooms look stunning! The redesign concept involved the whole family with significant inputs from my sister Ali and Jules’ father Bruce. Cousin Ian Shenton was visiting us in October and also lent a hand. However, most of the creative credit falls with Jules who absolutely immersed herself over the last 6 months in the design and sourcing of all the materials needed for outfitting the camp. New fittings including carpets, lighting and furniture have been brought in from all over, giving the rooms and camp a light, bright and airy feel without losing the core Kaingo DNA , which is based on experiencing the bush. 220v is provided to all the rooms from our upgraded 20 KVA solar plant and we have increased the size of the main dining area through some modifications, notably adding a new lounge area and extending the bar with the remaining bough of the same thousand-year old leadwood tree. Everyone who toiled over the rains to give Kaingo its new look is very excited and proud. Craig and Lyndie Reiche who manage Mwamba Camp spent many days researching and sourcing products in their native Cape Town during the off-season for both Kaingo and Mwamba, which has also seen some great updates. They have also been in camp with me since early May tirelessly working on the rebuild. Without this lovely couple’s commitment, we would never have finished in time. Meanwhile Malawian-born Italian, Agata has been extremely busy marketing the camps in UK, Europe and the world at large while also taking all the reservations. She has managed to book what is shaping up to be our busiest ever season, which we are very excited about. My thanks go out to this core team. I am also indebted to my local building team and long-serving staff who have helped us achieve this change in the short time we had available. Each person assigned to tasks and trained in new skill sets conducted themselves with enthusiasm and commitment. No job was ever too big and the smiles and light-hearted jokes going around gave the team all the momentum needed to meet the sometimes-daunting targets. My sincere thanks also to our local team; the Phiris, Mwales, Mbewes, Zulus, Njobvus and the Bandas. So 25 seasons later, after one or two small life changes including the birth of two beautiful daughters, and with the rebuild complete I am still on the riverbank at Kaingo, my favourite place in the world, guitar in hand watching the river flow. To all those visiting us this season – we can’t wait to welcome you into the new Kaingo and Mwamba. To those who are not, we will keep updating you with sightings as we progress through the season and hope to entice you to visit us in the future. 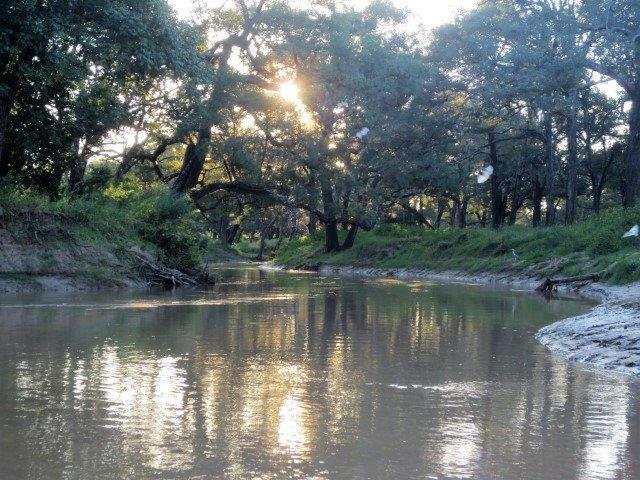 Heading up the stream that flows through the ebony forest in early May. This is where we should be driving through by this time of year – early May. Our first sighting of the Kaingo Mwamba pride when they came into camp. We had to use the boat to ferry everything across the still flooded river. 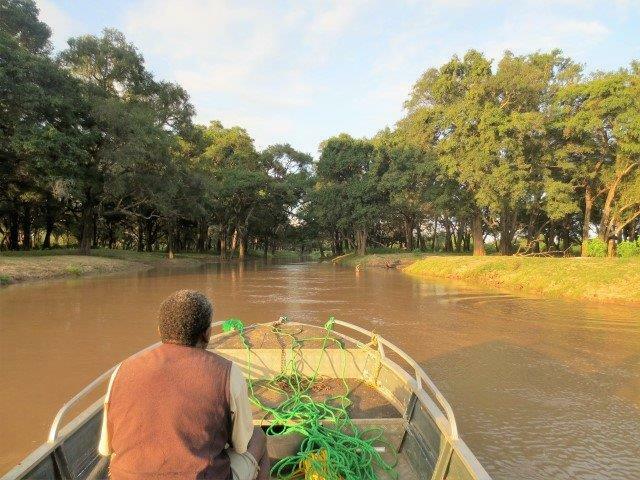 Crossing the Mwamba river at 2 Trees 05 May. Day 2 Mwamba rebuild 07 May 2017. Boss House at Mwamba early May. 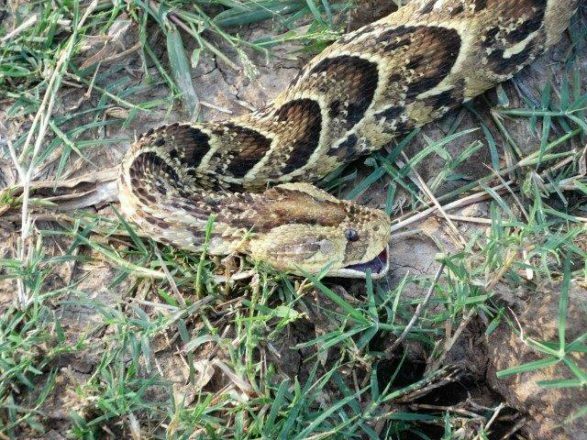 Unwanted help for the Mwamba rebuild – puff adder. Carpenters Simon and Joseph working on the new doors. 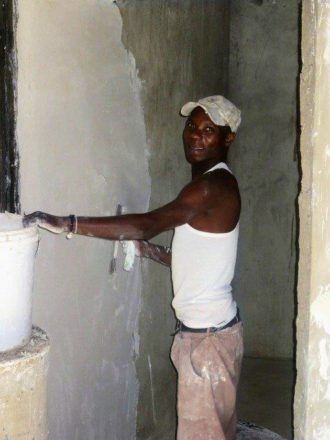 Albert , one of our brick layers who has also now learned good skimming techniques. The Kaingo leadwood bar with its extension from the same original tree. The Kamima stream through the ebony forest, early May.